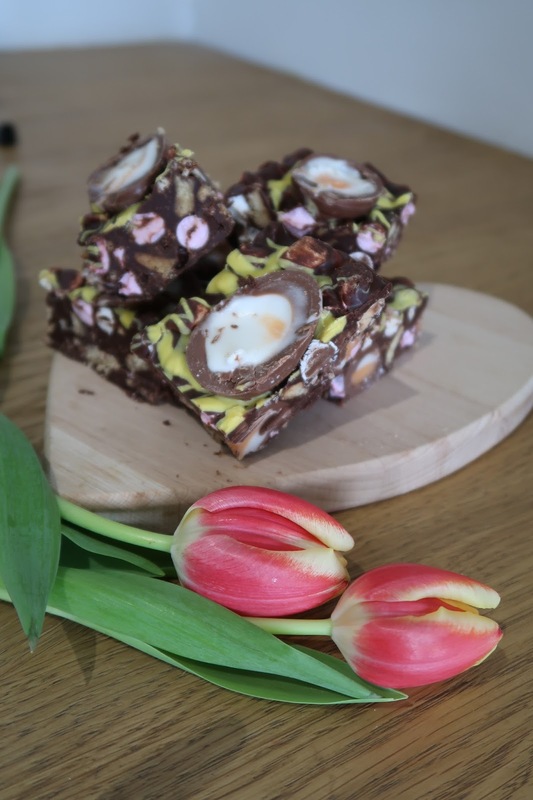 This month Nathalie from This Surrey Mummy shares with us her yummy Creme Egg Rocky Road treat! ‘As you know I LOVE a Cadbury Creme Egg – in fact I probably love them a little too much so when I saw a recipe containing biscuits, marshmallows, Creme Eggs AND Mini Eggs I might have wooped for joy a little. 2. In a bowl over a pan of simmering water melt your butter, dark chocolate, milk chocolate and golden syrup. 3. Place your biscuits in to a large sandwich bag and give them a good old bash until they have broken up but are not reduced to just crumbs. 4. Once the chocolate mix has melted remove from the heat and stir it the marshmallows, biscuits, mini creme eggs and mini eggs and give a jolly good stir. 5. Tip your chocolate mix into a lined tin. 6. In a separate bowl break up the white chocolate and melt over a pan of simmering water as before. 7. Once the white chocolate has melted stir in the yellow colouring. This will cause the chocolate to seize but by simply adding a little vegetable oil this will thin it out. Drizzle the yellowy white chocolate over the chocolate mix in the tin. 8. Remove the Creme Eggs from the fridge and slice length ways in half. Place the halves on top of the chocolate mix. 9. Pop the mixture in the fridge to harden up for at least an hour and a half. 10. Slice up into big fat slabs and enjoy! !